This Vaishnava Divya desam temple is believed to have been built during the 7th century by the Pandyas . A granite wall surrounds the temple, enclosing all its shrines. The temple has a five-tiered gopuram and the gateway tower is located behind a fort . Thirumeyyam is one of the eighteen Pandya nadu divya desams located near Tiruchirapally . It is about 13 miles from Pudukkottai on Pudukkottai-Karaikudi route and takes about two hours car drive from srirangam to reach this place. As the temple opens late around 7.30- 8.00 a.m., one can plan to have Viswaroopa darshan in Srirangam in the early hours and reach this place. The temple is administered by Pudukottai Endowment Department whereas the fort is under the control of Archeological Department. This cave temple is slightly older and dated to closing decades of seventh century. The temple has a main gateway on the east in the lowermost wall with shrines for guardian deities like Ganesa, Hanuman and Bhairava. There is a moat around the lower wall. On the top of the rock is bastion with cannon of british origin. Divya desam Perumal gives darshan in two forms as Meiyappar also known as Adi Ranganathar in Sayana Thirukolam (sleeping posture) and as Satyamurthy in Nindra thirukolam(standing posture) under Satyagiri vimanam on the banks of Satya theertham /Kadamba pushkarini) a satyavanam (venu vanam). As the Lord is the personification of truth, HE is glorified as Meiyappar/SAtyamurthy and the place came to be known as Thirumeyyam. The temple consists of an ardha-mandapa in front of the rectangular sanctum Along with the LORD , other deities like Garuda, Chitragupta, Markandeya, Brahma, the Devas, the Vasus, and the Kinnaras give darshan . There are two demons near the lotus feet of the Lord . Legend reveal that Lord Ksheerabhidhinathar in sayana thirukolam ( sleeping posture ) at this temple. Thirumeyyam is considered to be the largest and older than Sri Ranganathar at Srirangam. Hence the Lord is also known as Adi Rangan. While Lord was in Yoga Nidarai(yogic sleep), two demons named Madhu, Kaitapa were creating trouble .Goddess Sridevi took asylum in Perumal’s chest while Bhudevi resorted to Perumal’s thiruvadi ( lotus feet ) . Adiseshan who did not want Perumal’s slumber to be disturbed, chased away the rakshasas by emitting poisonous fumes which is beautifully depicted on the wall behind the deity . The ( demons ) rakshasas are seen fleeing away near Perumal’s feet. Adiseshan apologized to Lord ( Perumal) as he felt guilty for having done this act without Lord’s permission. The compassionate Lord placed HIS right hand on Adiseshan as a mark of gesture and love . A lotus stalk emerging from the navel of Perumal and on the lotus ,chatur mukha Brahma seated on along with 33 crore devatas worshiping the Lord is beautifully depicted on the walls. Apart from the above , Chitraguptan, Markandeyar, Brahma, Madhu, Kaitapar along with devatas can be seen inside while having darshan of Lordships . There are deities of Sudarshanazhwar , Andal, Narthana Krishna on the left side and Sri Lakshmi Narasimhan on the right side in the Moolasthanam. The utsava murthi-Lord Meiyappar along with ubhaya nachiyars give darshan in the Moolasthanam. The Moolasthanam is on a pedastal and one has to climb about 4 steps to have a closer view of the ever compassionate gigantic Perumal. For devotees Lord ‘s thirumukham(face) and Thiruvadi(feet) can be viewed from outside through two small window openings. Lord Satyamurthy’s sanctum is to the right side of Lord Meiyappar sannidhi. The utsava murthi gives darshan along with Sridevi,Bhudevi and Andal. Ujjevana Thayar has a separate shrine. 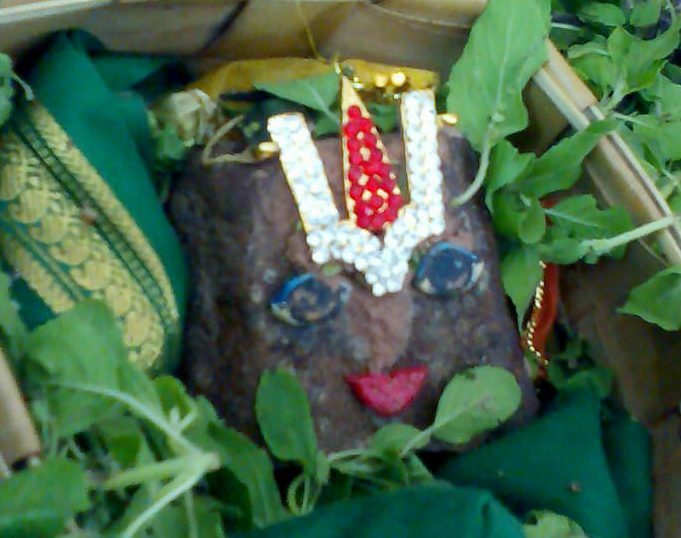 As the name depicts, the goddess gives ujjeevanam to the devotees. The childless couple offer special prayers to this Goddess for progeny . Opposite to Satyamurthy’s sanndihi is Garuda bhagavan’s sannidhi. On the right side , we can have darshan of Sita-Ramar along with Lakshmanan in a separate sannidhi opposite to which is Hanuman’s sannidhi. 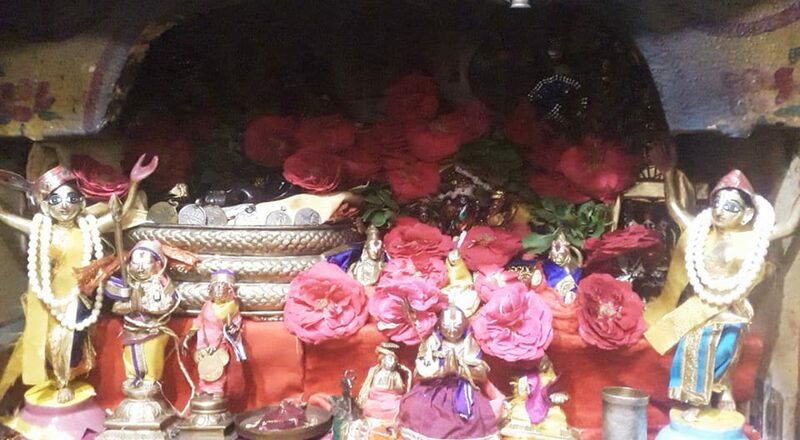 Andal gives darshan on the left side in a separate shrine. Brahmotsavam is performed for 10 days during Vaigasi(*May-June) culminating on Visagam (10th day with Theerthavari on that day). Garuda utsavam on 4th day of Brahmotsavam attracts huge crowds. The Thiru-ther utsavam on 8th day is equally important. Perumal appeared to Satya maharishi on Vaikasi-Pushyam day. Thiruaadipooram, Adhyayana utsavam during Margazhi(Dec-Jan), Sri Krishnashtami are few festivals which are performed grandly. The temple follows vaikhanasa agamam . Sathyagireeswaran( ParamaSivan) and Satyamurthy(Vishnu) temples are carved out of a single rock within the fort. Asuras defeated the devas and started ruling the world inflicting troubles on all living beings. There was no place for sathyam(truth) and dharmam(righteousness). Dharma devathai took the form of a bull and reached Azhagar koil for prayers while Satya devathai took the form of a deer and entered venu vanam(as this place was full of bamboo trees) and meditated on Lord Vishnu for help. Adisesha, the foremost servitor of the Lord assumes various forms and does kainkaryam to Perumal and Thayar eternally. A verse in Prabhandam goes like …. Adisesha acts as Umbrella when the Lord walks, he becomes simhasanam for the Lord to sit, he becomes padhukas to hold the tender lotus feet of the Lord when HE walks, he is the cosy bed and pillow on which the Lord rests in Vyuha form in Thirupaarkadal , he acts as light to the Lord and as silk cloth for the Lord. As Lakshmana , the service what he rendered to Sri Rama is remarkable. The thousand hooded Adisesha came down from Ksheerabdhi and traversing through the bowels of earth reached this place. Assuming the five hooded form , Adisesha contemplated on the Lord at this place .Lord appeared and granted his wish to give darshan in Sayana Thriukolam as HE is in Thirupaarkadal. 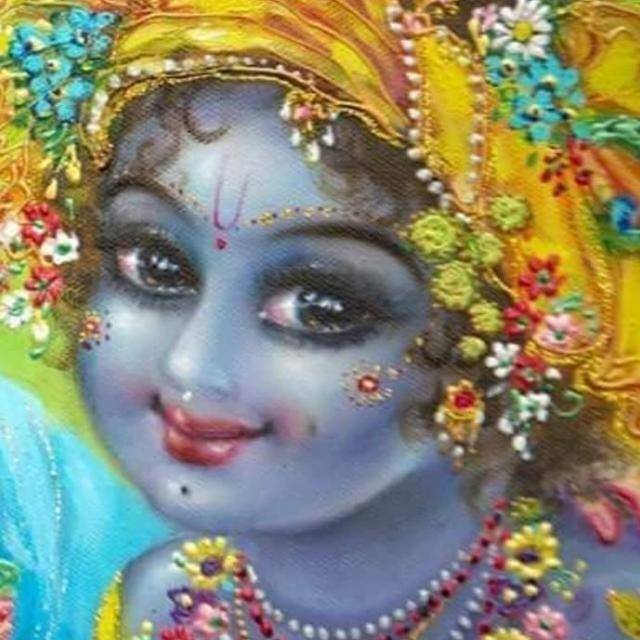 Hence,we have darshan of the Lord as Ksheerabdhinathan. Legends reveal that once , Sathyavatha Maharishi was doing penance sitting on Chithrasilai under a banyan tree named Pathiravadam near Pushpathirai river at the foot of the Himalayas. He went into the woods for collecting sticks for daily homam ( havan ) . He unknowingly cut his finger in the process , which he was unaware as it did not cause any pain or blood oozed. By the time he returned to his hermitage, the finger grew . Gandharvas observed this strange incident to Indran. Indran and his brother,Upendra disguised as hunter and a boar came into the vicinity of the Rishi’s ashram . Mahavishnu who had taken the form of boar appeared as if he was hit by the arrow reached the ashram and sought asylum. Tracing the foot prints of the boar, the hunter approached the rishi and requested him to tell him about the whereabouts of the boar so that he could save his family who were on the verge of death due to starvation. The rishi was in a dilemma because if he told the hunter about the boar’s hiding place, the hunter would kill the boar and he would not be able to keep up his promise of protecting the boar. The rishi ,who was an embodiment of knowledge, philosophically explained the actual truth and advised the hunter to refrain from this crime. Lord Vishnu and Indra appeared in their true forms before the rishi and praised him for his devotion. Lord Vishnu advised him to go to Sathya kshetram and continue his penance and assured him of salvation along with Pururavas Chakravarthi. The rishi expressed his gratitude towards the rock named Chithrasalai on which he sat, the banyan tree which gave him shelter and the river Pushpathirai in which he had bath. Perumal replied that the rock and the banyan tree would be transported on Iravatam, Indra’s elephant to Satya kshetram and the river would appear there as theertham. River Pushpathirai now flows as Satya Pushkarini, the rock is now the big cave in which the temple is built and the banyan tree is the sthala vruksham. Thirumangai azhwar has composed several pasurams on great Lord in Peria Thirumozhi . Azhwar quotes LORD of Thirumeyyam in several pasurams while glorifying the LORDSHIPS in other divya desams which shows is deep affection to our LORD here . Azhwar refers our Lord at Thirumeyyam as Lord Rama . Lord holding the Kodandam Bow that pierced seven sala trees is memorable . Azhwar has a deep desire to hug the Lord’s broad chest at least once for his valor . In another pasuram , while glorifing Srinivasa Perumal at Thirunaraiyur who happens to be Azhwar’s acharyar, Azhwar glorifies the Lord at Thirumeyyam as the one who in Krishnaavataram burnt the Kandava vanam. In another pasuram Azhwar takes the role of a mother whose daughter is in deep love with Perumal and suffering from pangs of separation. The mother says that her daughter is lamenting by taking the names of Lord of Thiruvenkatam, Thiruneermalai,Thirukannapuram, Thirumeyyam and asking the whereabouts about Thirumeyyam. In another pasuram , Azhwar compares the dark complexioned Lordships residing at Thirumeyyam to the dark sea, mountain, dark clouds ready to pour rain, compares to Kuvali flower(dark flower) and says that the hands which do not fold in front of Thirumeyyam Perumal are not considered to be hands at all. Pics credits : Google images /All advanced devotees who have uploaded the same .